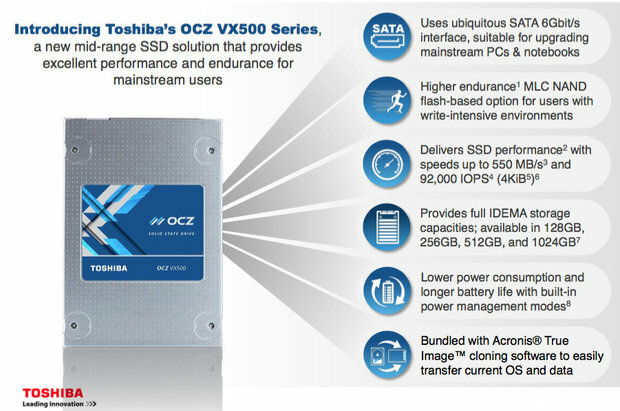 Toshiba's new OCZ VX500 SSD line will retail for 30 cents to 37 cents per gigabyte, among the lowest for NAND flash memory. Toshiba America Electronic Components today announced a new line of SSDs under its OCZ brand, and those drive prices are comparable to some of the lowest in the industry based on similar technology. 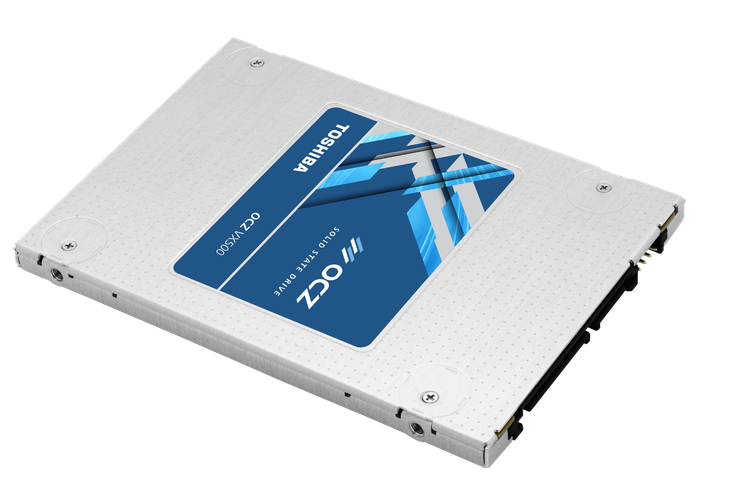 The new OCZ VX500 SSD line is targeted at mainstream desktop and notebook users who may want to upgrade from the hard disk drive (HDD) that came with their machine to an SSD with better performance. The VX500 series is a 2.5-in form factor, 7mm thick SSD based on multi-level cell (MLC) NAND flash, which stores two bits per cell versus the three bits per cell found in triple-level (TLC) flash. The drive uses the Serial ATA (SATA) 6 Gbit/s interface. Toshiba is marketing the line as a "mainstream"-class SSD, as compared to its RD400 PCIe-based "enthusiast" SSDs and its TR150 SATA-based "value" line of SSDs, which are based on denser and less expensive TLC flash. In March, the price computer makers paid for solid-state drives (SSDs) dropped by as much as 12% over the previous quarter, and the most popular drives were coming within striking distance of their HDD counterparts. 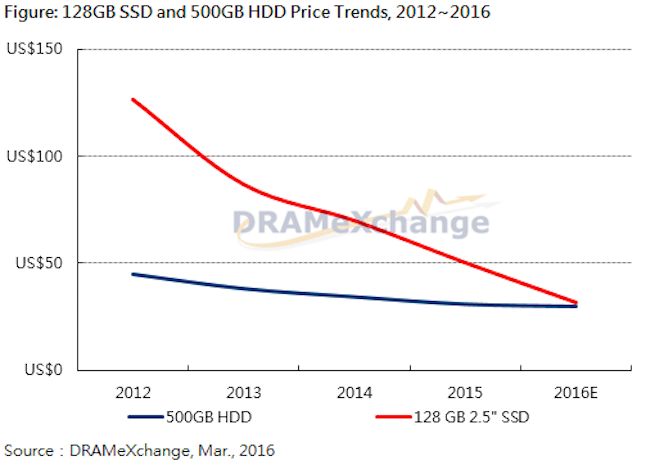 Based on DRAMeXchange's analysis, the price difference between 128GB SSDs and 500GB HDDs will shrink to less than $3 this year. The price difference between 256GB SSDs and 1TB HDDs is also expected to be less than $7. That said, at a per-gigabyte cost, SSDs are still about four times pricier than HDDs. In the first quarter of this year, MLC-based and TLC-based SSDs saw price declines of 10 percent to 12 percent and 7 percent to 12 percent, respectively, according to DRAMeXchange, a division of TrendForce. SSD and hard disk drive pricing as of March 2016. In June 2015, the average retail price consumers paid for a 128GB SSD was $91.55; for an SSD in the 240GB to 256GB range, the price was about $165.34, DRAMeXchange's data showed. Toshiba's OCZ-brand VX500 drives are almost half that price, according to the company's product launch pricing, which often drops quickly at online retail sites. The VX500 drive line comes in capacities of 128GB ($63.99), 256GB ($92.79), 512GB ($152.52) and 1TB ($337.06). The 1TB drive represents a cost of about 30 cents per gigabyte, far from Toshiba's least expansive drive, but it is still comparable to other MLC-based SSDs. By comparison, Toshiba's TR150 value SSD line sells for about as little as 22 cents per gigabyte on retail sites such as Newegg.com. For example, the 960GB TR150 SSD retails for $210 on Newegg. Toshiba's new VX500 line is also right at the top of the performance curve, according to DRAMeXchange benchmark tests of comparable MLC-based SSDs. For example, using AS SSD Benchmarking software, Micron's Crucial MX 200 SSD -- with a capacity of 500GB -- has a top sequential read/write rate of 515MB/s and 472MB/s, respectively, according to DRAMeXchange. 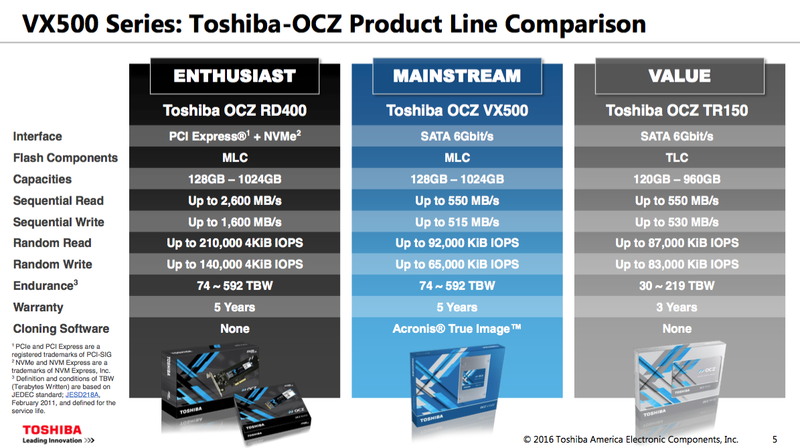 Toshiba's initial retail pricing for its OCZ-branded VX500 SSD line. Toshiba claims its new VX500 line has sequential read/write speeds of up to 550MB/s and 515MB/s, respectively. The drivers have a random read/write performance of up to 92,000 and 65,000 4KiB5 input/output operations per second (IOPS). Toshiba also claims the new SSD line has three times the endurance of comparable consumer SSDs based on TLC NAND flash; the company claims the drives can withstand up to 592TB worth of total writes in the 1TB model versus 150TB of total writes sustainable by other leading TLC SSDs, "making it suitable for write-intensive applications such as content creation, revolving media/game storage, or as a scratch disk," the company stated. Toshiba's own TR150 value line of SSDs sports a top write endurance of 240TB, less than half that of the 1TB VX500 SSD. The new VX500 SSD series will replace Toshiba's VT180 (or Vector 180) series, while still offering many of the same features, including free Acronis True Image cloning software for migrating data from an HDD to the new SSD and a five-year warranty. By comparison, the TR150 value SSD line comes with a three-year limited warranty. "The VX500 series was designed for today's DIYers looking to upgrade from traditional hard drives with a solid state solution that thrives in the wide spectrum of mainstream-oriented, mixed workload applications," Alex Mei, Toshiba America Electronic Components' general manager of Etail/Retail SSDs, said in a statement.